​Spectrum-Roulette® TURBO™ is a roulette variant played with a Proprietary Roulette-wheel, containing four copies of each digit one to nine, plus a zero. Each of the four instances of each digit is one of four unique colors: combined with the Green zero, this gives 37 unique combinations of digit and color. 1. 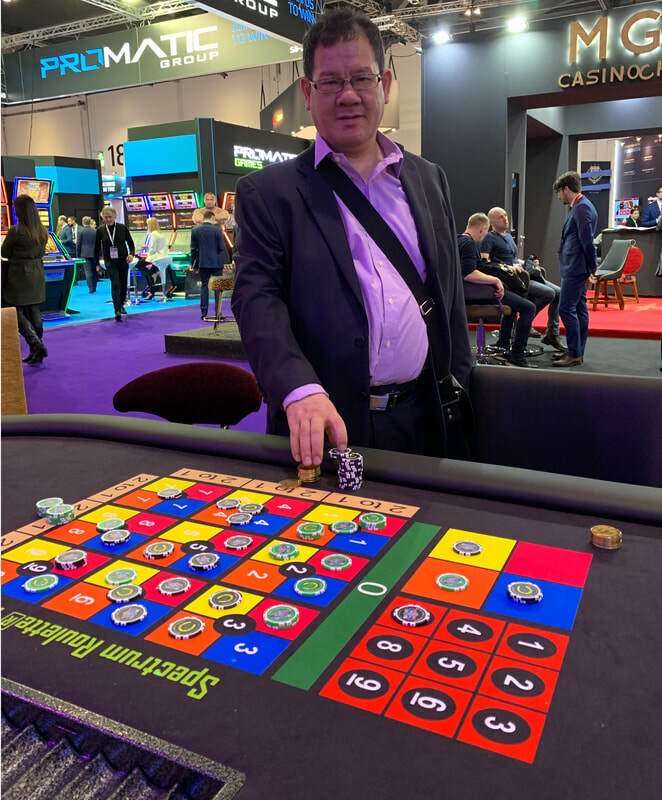 Players place their bets on the Spectrum-Roulette® layout. 2. A Roulette-Wheel numbered 0 to 9 with Colours is spin. 3. According to the winning number and Colour. Dealer then collects all losing bets and pays winning bets according to the Pay-table. Straight-up Bet (a number + 1-colour) Pays 35 to 1. Split-Bet -------- (a number + 2-colours) pays 17 to 1. Corner-Bet ----- (a number + 4-colours) Pays 8 to 1. Colour-Bet ------ Pays 3 to 1. The Triple-Hit® is a proposition bet based on three consecutive Spin of the Wheel. 1. The Player places a bet on a single number in the Triple-Hit® section of the layout. 2. If the Player does not hit his number, he loses his Triple-Hit® bet. 2a. If the Player hits his number, he’s paid 5-to-1 and the Triple-Hit® bet remains in play for a Second-round. 3. If the Player does not hit his number in the Second-round he loses his Triple-Hit® bet, but he keeps his first-win 5-to-1 payout. 3a. If the player hits his number on the Second-round, he’s paid 25-to-1 and the Triple-Hit® remains in play for the Third-round. ​4. If the Player does not hit his number in the Third-round he loses his Triple-Hit®, but he keeps his First-win of 5-to-1 and his Second-win of 25-to-1 payout. 4a. If the Player hits his number on the Third-round, he’s paid 100-to-1 and his Triple-Hit® is returned, for a net payout of (5 + 25 + 100 = ) 130 to 1.